Kobelco to demonstrate recycling credentials at Donington Park Circuit - Kobelco Construction Machinery Europe B.V.
KCME will showcase SK210D Car Dismantling machine at CARS trade show in July. 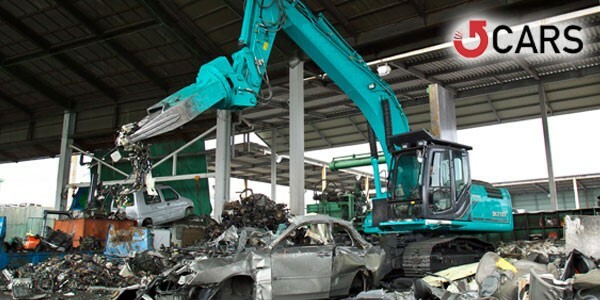 Kobelco Construction Machinery Europe B.V. (KCME) is pleased to announce its attendance at the Complete Auto Recycling & Secondary Materials (CARS) trade show at Leicestershire’s Donington Park Circuit on 13-14 July. The manufacturer, in conjunction with authorised UK dealer partners Molson Group Ltd and Lloyd Ltd, is keen to demonstrate its credentials in automotive reclamation by showcasing its technically advanced SK210D-9 Car Dismantling machine. The free-to-attend CARS trade show is Europe’s premier event for auto recyclers and its hands-on approach with live demonstrations and interactive sessions is unique in the industry. Visitors to the event will be able to see the SK210D-9 Car Dismantling machine in action at the demonstration area, and speak to Kobelco product managers and representatives from both dealerships who will be on hand to answer any questions about the machine. Kobelco developed its first excavator-derived machine specifically for automotive reclamation in 1979. At the time, the impact of this new machine in the Japanese market was huge and led to Kobelco further investing in car dismantling technology. Now, 37 years later, Kobelco still leads the way in automotive reclamation with the SK210D-9. The machine is designed to strip end-of-life vehicles (ELV) safely and can convert a complete ELV chassis into manageable parts for the total reclaim of key recyclable products in rapid time. In fact, the Kobelco SK210D-9 has four-times the dismantling capability compared with hand dismantling. As well as increased productivity and reduced labour costs, the machine also delivers smooth hydraulics and suspension as well as low fuel consumption.